Place eggs in a saucepan, cover with enough water above the eggs about 1 inch. Bring water to a boil about 20 seconds. Remove from heat, cover with lid and leave it for 20 minutes. Drain hot water and fill up the saucepan with cool water. While the eggs are cool enough for hand to handle. Peel the eggs carefully, you want a beautifully hard-boiled egg. Gently remove all the egg yolks and transfer to a bowl. Add mayonnaise, mustard, coriander, ground peanut, salt and pepper. Mix well. Spoon egg yolk mixture and fill the cups of egg white until the filling is a little over the cup. 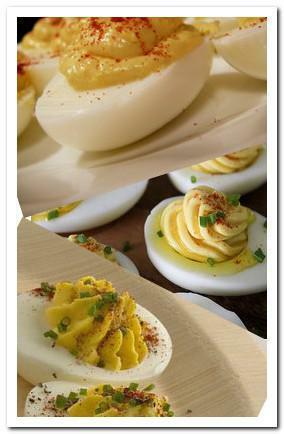 Deviled eggs are a great snack or appetizer during gatherings. It is easy to make and there are heaps of variation you can try. Hard-boiled eggs turn into a delicious snack in just a few steps. It is always served cold.